Anthrax co-founder and rhythm guitarist Scott Ian recently told Billboard that the comeback album might soon see an Expanded Edition release, which would include a planned EP of cover songs called Anthems. The EP, which includes Rush’s “Anthem,” Thin Lizzy’s “Jailbreak,” AC/DC’s “TNT,” Boston’s “Smokin’,” Cheap Trick’s “Big Eyes,” and Journey’s “Keep on Runnin’,” might also be available as a digital download for people who already own Worship Music. “Rob has been an integral part of Anthrax for so many years, as our lead guitarist, in a production capacity, but most of all, as our close friend. His contributions to the band have been enormous. While we are sad that he is leaving, we wish him nothing but great success going forward, and hope to share the stage with him again sometime down the road. 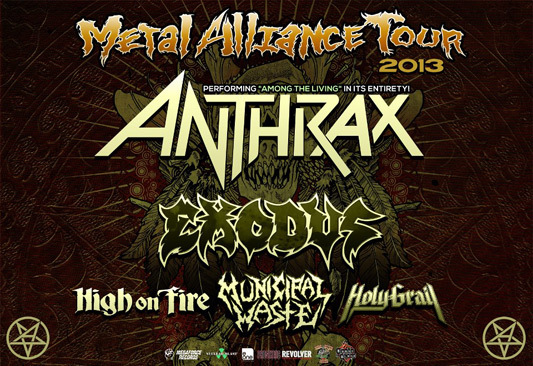 For Metal Alliance Tour tickets, visit: Metal Alliance Tour. *For these albums, when you purchase the CD, you also get the digital MP3 download of the album for FREE.